The most important day is August 24, Sant Bartomeu, patron of the city. Thus, activities are scheduled around this day for all sitgetans and visitors to discover that Sitges is much more than sun and sand. This year, the festival will officially start on the the evening of August 21 with the traditional "Pregó satiric" in front of Palau del Rei Moro, and the official opening speech will take place at 10pm. The other events of the festival of Sitges are divided into two main areas: the religious and the cultural and traditional, never forgetting, of course, the festive one. Regarding religion, the most popular acts are the “repic” (ringing) of bells, the “Ofici Solemne” and the procession of Sant Bartomeu and Santa Tecla; while in the cultural-traditional and festive area, the events that draw more people are the parades, folk dances, castellers, the fireworks or the "Gegants" (giants). In fact, there are three pairs of "Gegants" which go out in the traditional "Seguici Popular": those of the Vila, the “Moros” and the “Americanos”, along with an eagle and a dragon. The first pair are Jaume and Geganta, which embodies the figure of a lady of the 19th century. They began to file in 1897 and now they only appear by Corpus and very important dates, since new giants were manufactured in 1975, the Gegants Nous. 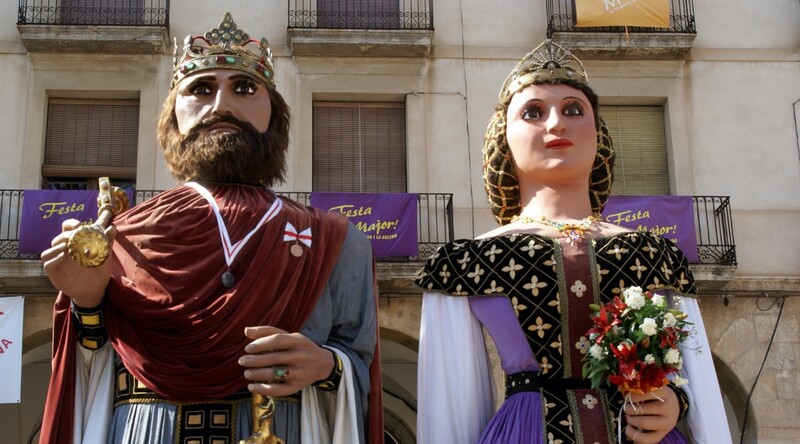 The "Gegants Moros" Faluch and La-hia, were the first giants that Sitges had, they were created on 1840, according to the documents. The original ones finished their public appearances in 1912, but the Agrupació de Balls Populars started using them again in 1979. And then, Sitges has the "Gegants Americanos", representing the “Indians” who came to the city after making a fortune overseas. They were the last pair to join the party, and they do so since 1965. In the “Seguici Popular”, bastoners also walk the downtown streets, along with “diables”, “Gitanes” “panderers”, “pastorets”, “castellers”, “Capgrossos”, the dragon, the eagle, the “Moixiganga”, and all enlivened by folk music and dances of "Cercolets" and ribbons among others. As well as all this, the "Barraques of Sitges" will also take place in Paisseg de la Ribera. Bands and DJs enliven the party on August 17, 18 and 19. You can check their Facebook page to see the poster with all the artists that will be performing. In addition to these activities, Sitges is transformed during these days in many small events that will not go unnoticed for the visitor. Every street in the center is decorated to enjoy this week. From Sitges Group Apartments, we invite you to join the fun and experience the “Festa Major” with us. Discover the full program of the “Festa Major”!